Hey everybody! The new website is now up and running at www.worldsworstrecords.co.uk - at the moment it's a bit basic, but over the coming days and weeks I'll be adding more music and video there as well as links to other great bad music resources. If there's something you're looking for - or a story you want to tell - there's also a contact page to make it easier for you to get in touch with me. While you're there you can also find out about - and, if you wish, order - my new book. 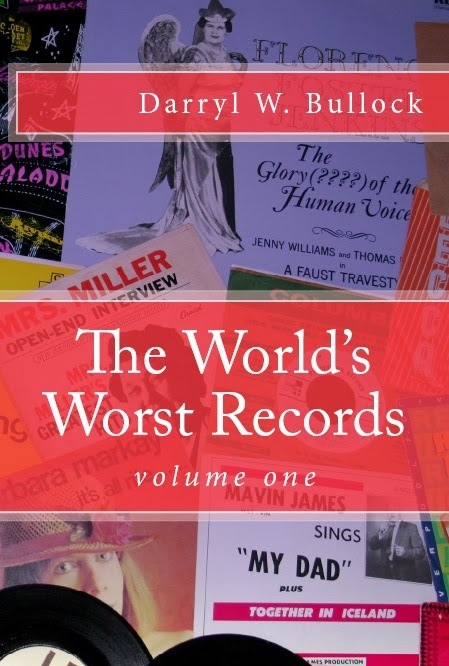 Called, perhaps unsurprisingly, The World's Worst Records it runs to over 250 pages, is illustrated throughout and, as well as covering many of the discs I've featured on the blog since it began back in 2007, includes a bunch of new stuff. And its under a tenner (or under $16 if you live in the States)! Just in time for Christmas! 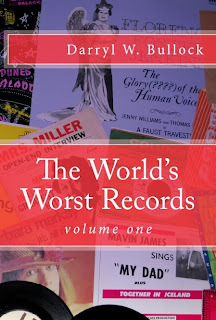 The World's Worst Records Volume One is available now from Amazon worldwide. The Kindle edition will be available shortly. As a bonus, you can also download a 14 track compilation featuring tracks mentioned in the book so you can listen along whilst reading about your favourite bad music. I’ve got a lot of time for spoken word records, as any of you who have been following this blog for a while now will know. The chances are, if a disc has a spoken word passage or – better still – it’s entirely narrated rather than sung then it’s almost preordained that it’ll be awful. 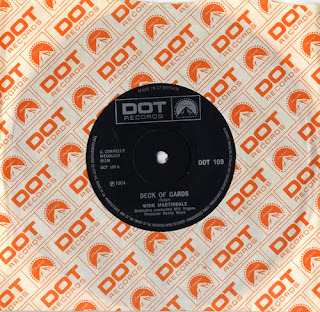 And the granddaddy of all awful spoken word records is Wink Martindale’s huge 1959 hit Deck of Cards. Winston Conrad "Wink" Martindale was born in Jackson, Tennessee, and started his career as a disc jockey at age 17 at WPLI in Jackson. His version of Deck of Cards, the ridiculous, melodramatic story of a soldier caught playing snap at the back of a church, went to Number Seven on the Billboard chart, selling over a million copies; four years later it reached Number Five in the UK. This wretched record just won’t die: Martindale has been in the UK charts with it on three different occasions, and it has been recorded by everyone from Texas Tyler (in 1948) to WWR favourite Pat ‘The Deal’ Campbell. Ignore the last line: I know! That soldier was me! No it wasn’t. The original story, which Tyler adapted for his recording, has been known since at least 1762 – 180 years before any American soldier became involved in WW2! Wink began his TV career in Memphis, as the host of science-fiction themed children's television programme Mars Patrol. His first game show job came in 1964, when he fronted the NBC show What's This Song? More recently he has hosted TV versions of Trivial Pursuit, Boggle and the show Debt, which saw contestants compete to try and eliminate their debts. Still a popular face on American TV (at the grand old age of 79), in June 2006, Martindale received a star on the Hollywood Walk of Fame and, a year later, he became one of the first inductees into the American TV Game Show Hall of Fame. As an extra, I’ve also included Max Bygraves’ white bread version of this appalling song. Inexplicably popular - especially as the man was a dreadful singer and a terrible game show host (another thing he shared with Wink) – old waxy Maxy’s career began in earnest shortly after the Second World War. He appeared in a number of movies before establishing himself as a housewives favourite, releasing an endless stream of albums and singles through the 50s and 60s. When he issued his version of this godawful record (in 1973) it managed to reach Number 13 on the UK charts. Sniffing out the possibility of a few sales the Martindale version was reissued, reaching Number 22. The former boxer and RAF fitter (born Walter William Bygraves), Max died last August, just a couple of months shy of his 90th birthday. Married to former WAAF sergeant Blossom Murray, with whom he had three children (the youngest of which became his manager later on in his career) for almost 70 years, naughty Maxy also fathered three other illegitimate children who, although he went to great lengths to distance himself from, finally made peace with the serial philanderer shortly before his death. Wigg, probably best remembered for conducting a series of interviews with the Beatles as the group was dissolving which appeared in 1976 on the double album The Beatles Tapes (and which the band tried, unsuccessfully, to have banned), had been the pop music reporter for the Daily Express and an interviewer for the Radio One show Scene and Heard. He was also great friends with the late Freddie Mercury. Unfortunately we catch him here around a decade before he met Fred, covering a song by Chris Andrews of Yesterday Man fame. 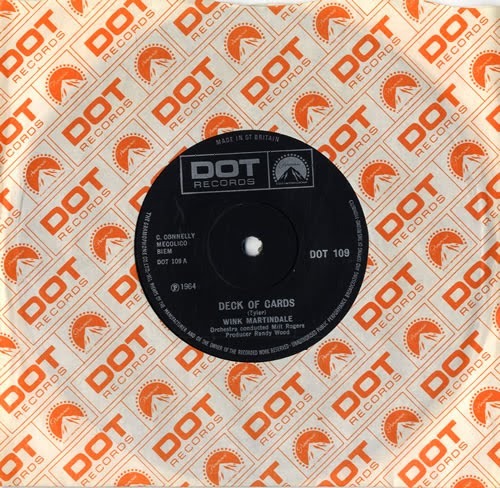 In London, at the height of the Swinging Sixties, pretty much anyone who looked the part or had the connections could get a record released. It's clear though that some of them should never have bothered. 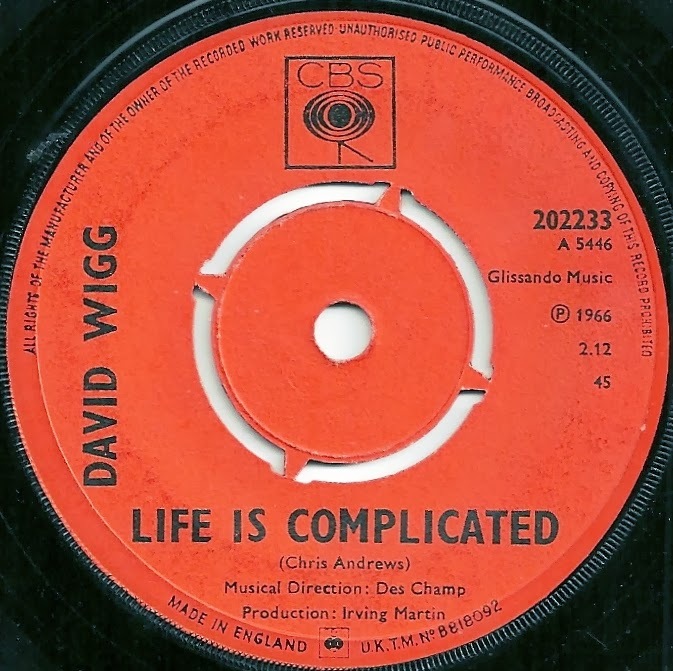 Wigg, with a recognised 'name' in the pop world, was a reasonably obvious choice for a producer looking for a quick hit; throw in a writer with the credentials of Chris Andrews - who, besides his own mega hit had written a string of chart entries for Sandie Shaw and Adam Faith - and surely the result was bound to click with the young, hip and happening audience? 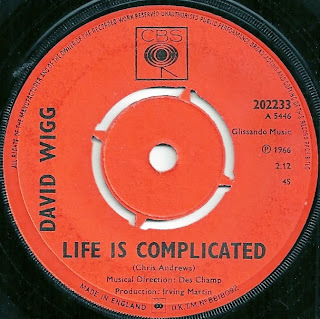 However, Life Is Complicated is a ridiculous record: Wigg's performance is flat and atonal and the bombastic backing (a Chris Andrews trademark) tramples all over the vocal. Its B-Side, Turning Round, is little better: to me Wigg sounds like a bored geography teacher at a karaoke party trying to convince his listeners that he really is a fun chap, honestly. The jolly girl backing singers and the arrangement, by Des Champ (who would go on to bigger things with Chicory Tip and Vanity Fair) are lively enough, but what little voice Wigg possesses is completely unsuited to the material. Thankfully this appears to have been his one and only stab at pop superstardom: David wisely chose to return to the other side of the microphone (taking a brief detour to write the liner notes to the Bulldog Breed album in 1969) and is still working today, writing regularly for the Daily Mail. Thanks to the excellent Lord of the Boot sale blog for the image. 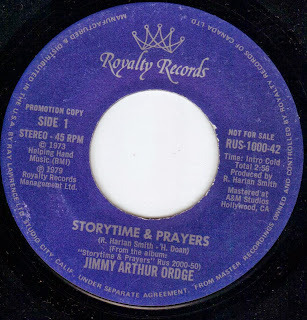 A vile slice of prime country ham for you today, courtesy of Canadian singer Jimmy Arthur Ordge. Born on December 6, 1935 and raised in Donalda, Alberta, Ordge began his career his teens, after the family moved to Edmonton. He appeared regularly on local radio and television shows as well as in music reviews such as Old Dad Taylor's Jubilee Jamboree. Starting out as a rockabilly guitar player and singer, while playing at a club in Whitehorse (in the Yukon), he met local rockabilly singer Al Oster: It was a cover of Oster’s song Irena Cheyene that gave Jimmy his first hit single. Other hits followed, including Muk Tuk Annie and the Johnny Cash-inspired Jewish trucking song Hershel's Hemi Half-Ton. He quickly moved from rockabilly to a more traditional country idiom, part singing, part intoning his vocals in a style reminiscent of the late Jim Reeves. And it’s here that we find this particular travesty, the awful Storytime & Prayers. Recorded in 1979, it’s a record so steeped in the C&W staples of dead spouses, crying children and religion that I find it impossible to believe that it has not inspired a suicide or two. Jebus: all it needs is an empty whisky bottle thrown at it - and perhaps a drunken trucker or two - and it’s got everything. The song was co-written by fellow country singer R Harlan Smith, who also happened to be the founder of Royalty Records, the company that put this rubbish out. Unfortunately my copy is a mono/stereo promo, so I can't give you what would have been the original B-side. Probably for the best. I don't want you all slitting your wrists. A compilation of his best-known work, The Legend, was released by Royalty Records in 2004. Unsurprisingly, Storytime & Prayers was included. A shortish post today - I've got some other WWR-related work which I simply must get on with this weekend - but I couldn't let a Friday pass without giving you something to listen to. Today we return to the career of serial audio-criminal Jess Conrad, the man who will be forever celebrated (in my house, anyway) for having once bitten the end of Heinz Burt's nose. Here, for your enjoyment, are both sides of his 1961 hit Mystery Girl/The Big White House. He may have had matinee idol looks, but the actor-turned-vocalist couldn't sing for toffee. As with pretty much everything Jess recorded, it's abysmal. Goodness, people were gullible in the days before The Beatles. The A-side, with its arrangement stolen lock, stock and barrel from the Elvis hit Teddy Bear, is a horror and, although not in the league of his perennial bad music favourites Cherry Pie, Why am I Living or This Pullover, the B-side is equally terrible, with flat, atonal vocals and a dull-as-ditchwater performance. The lyrics of The Big White House put me in mind of another awful 45, Dickey Lee's Patches: the major difference here, of course, being that neither Jess nor his beloved committed suicide. 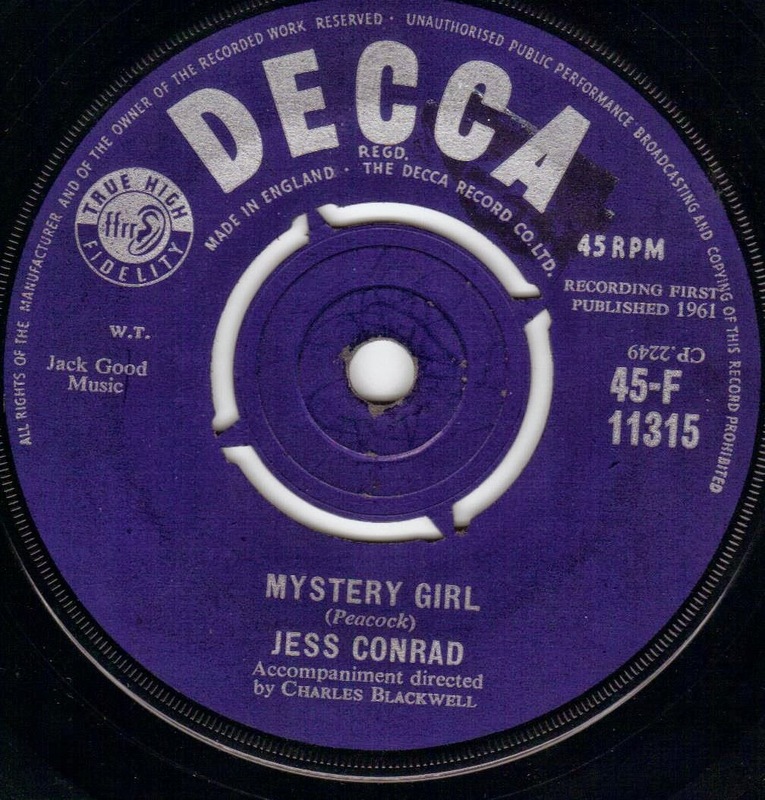 Conrad's third single also became his penultimate and biggest chart hit, reaching number 18 in February 1961. It also featured as the lead track on his first Decca EP. 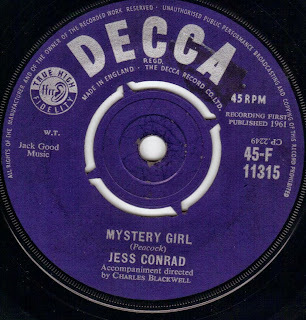 As an interesting aside, Mystery Girl was written by Trevor Peacock, who also penned hits for Herman's Hermits (Mrs Brown, You've Got A Lovely Daughter), Joe Brown, Adam Faith and others. Peacock would later switch to acting and find fame as Jim Trott in the hit BBC series the Vicar of Dibley.